The 1916 Philadelphia Athletics may have been the worst team in modern baseball history. How did they get that way just three years after winning the World Series, and how did Connie Mack keep his job—for 34 more years? This story appeared in the June 6, 2016 issue of SPORTS ILLUSTRATED. To subscribe to the magazine, click here. You can also personalize SI with our new App. Install on iOS or Android. There was a wooden bench made of bats and studded with baseballs. Otherwise there was nothing in Connie Mack’s office to suggest that he managed a major league team. Befitting a man who wore a suit and tie in the dugout, Mack decorated his office inside Shibe Park in a style you might call Accountant Gothic. There was a big oak desk, a wooden filing cabinet and a high-back swivel chair. By accident or design, players who paid a visit to the room got the feeling that they were there for a business meeting. And players had many such meetings in that office during the mid-1910s. During the first half of that decade the Philadelphia A’s, which Mack managed and partly owned, won the World Series three times—in 1910, ’11 and ’13—and unexpectedly lost it once, in ’14. They were a true dynasty of the Dead Ball era. And like many other dynasties, this one crumbled spectacularly. Unlike many other dynasties, however, it fell by its own design. Starting in the fall of ’14, player after player walked into Mack’s office and sat in front of his desk. As forthright and honorable as ever, Mack looked each man in the eye and explained that he had been traded, sold or released. Mack trafficked in the let-’em-down-easy talk that will ring familiar to sports fans a century later. In order for the franchise to move forward, it’s time to embrace a youth movement. . . . It would be fiscally irresponsible for us to match your competing offers. . . . It isn’t personal; it’s just business. Mack offered a familiar trope to the media and the A’s fans too, reassuring them that the team was building for the future, that any short-term pain would be to the long-term benefit of the franchise. In truth, though, this was a fire sale—the gutting of a successful roster that would prefigure, say, Jeffrey Loria’s dismantling of the Marlins after they won the 2003 World Series. Mack has often been depicted as a skinflint, and this was a vivid illustration of his tight-fisted ways. In the early 1910s the A’s boasted the “$100,000 infield” of Frank Baker, Jack Barry, Eddie Collins and Stuffy McInnis. By midseason in ’15, after Barry and Collins had been sold off to the Red Sox and the White Sox, respectively, the running joke was that Mack now had a $10 infield. Some observers were more charitable, asserting that Mack was simply acting as a prudent businessman. Before television contracts and licensing deals and luxury suites, baseball relied mostly on attendance for revenue. Anyone venturing to North Philadelphia and scouring the modestly populated stands at Shibe Park could see that if the A’s were to stay solvent, they could not pay players handsomely. One point, though, is not in dispute: The cost-cutting exacted a brutal toll. The 1915 Athletics finished in last place, with a record of 43–109. As for the ’16 vintage . . . well, calling those A’s awful understates the misery of that season. The current -sportspocalypse in Philadelphia, with the 76ers and the Phillies drowsing through the last three seasons? It has a historical precedent. A century ago this spring the Athletics—or the Pathetics, as they were inevitably nicknamed—set an enduring standard for losing in baseball. You could even make a strong case that they were the worst team in the history of major U.S. pro sports. The ’16 A’s went 36–117, for the lowest winning percentage (.235) in modern major league history. (The Cleveland Spiders had gone 20–134 in 1899.) Philadelphia finished at or near the bottom of the league in most statistical categories. One of its shortstops, recruited from a Universalist seminary, committed 78 errors, tops on a team that made a total of 314—more than two each game. Two pitchers went a combined 2–36. The A’s finished 40 games behind the league’s next-worst team, the Washington Senators. This, though, might be the strangest part of the story: There were no calls for Mack’s head. Today the man in charge of such a disastrous team would sit on the most searing of hot seats. Talk radio would blast him daily. The social media spanking machine would rev up (#sackmack). Yet in 1916 there was no suggestion that after 16 seasons it might be time for Mack to switch roles. In fact, after the season he was pursued for a managerial job by the Red Sox, the team that had just won the World Series. Mack declined and continued as Philadelphia’s skipper. It was a job he would hold for the next 34 years. Cornelius McGillicuddy was born in December 1862, a few days after the Civil War’s Battle of Fredericksburg. Though he never formally changed his name, he shortened it to Connie Mack. The son of Irish immigrants, he was a middle school dropout who developed a fondness for baseball, then a roughneck sport that was gaining in popularity. Playing in the minors beginning in 1884, Mack watched team after team fold, unable to make its payroll. That affected him deeply. Mack played 11 pro seasons, most of them as a catcher. After four years with the Washington Nationals of the National League he decamped to the new Players League, joining the startup Buffalo Bisons in 1890 and investing his life savings of $500 in shares of the club. The league lasted a year, and Mack went broke. He then joined the Pittsburgh Pirates, earning as much as $200 a month during the season, but the experience of losing his money in Buffalo had left a mark on him. As a player Mack put up unremarkable statistics. Bill James would later say that Mack was “a light-hitting catcher with a reputation as a smart player but didn’t do anything particularly well.” That’s not entirely true. Mack had a standout talent for baseball’s dark arts. As an opponent prepared to swing, Mack would tip the hitter’s bat with his mitt, throwing off the batter’s timing and momentum. And in an era in which a foul tip caught by a catcher was an automatic out, no matter what the count, Mack would mimic the sound of a foul tip on swung strikes. These tricks were at odds with Mack’s disposition. He rarely drank, and he didn’t smoke or curse. As Time magazine once put it, “Mr. Mack, as his players called him, remained a gentleman. Rumor had it that the harshest expletive was a mild ‘goodness gracious.’ In fact, he could put out an angry, ‘Damn.’ ” Well over 6 feet tall and sprouting heroically bushy eyebrows, Mack might have looked menacing, but when he opened his mouth, he revealed himself to be measured and self-aware—a logical, likable, natural leader, often called on to arbitrate conflicts among teammates. Other ball clubs, fearful that this expansion team and its giddy new ownership would poach players, did not greet the A’s hospitably. John McGraw, managing the Orioles before moving to the Giants, called the new franchise “a white elephant.” Showing his sense of humor, Mack immediately ordered a white elephant embroidered on the team logo, a touch that persists to this day, even as the A’s reside in Oakland. 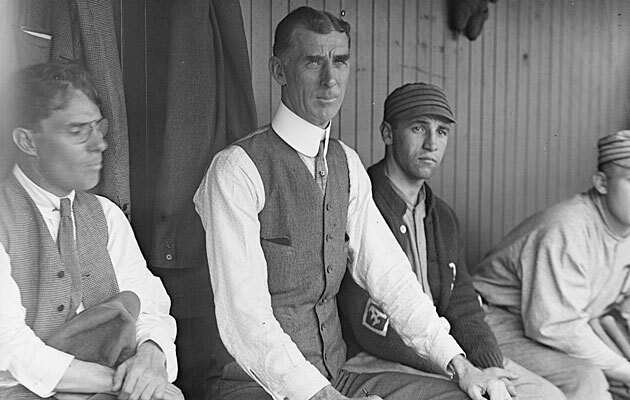 The persuasive Mack (center) convinced the owner to make Mack an equal partner and leave baseball matters in his hands. In 1908 the owners broke ground on Shibe Park, a stadium that would be built for a little less than $200,000, roughly $5 million in today's dollars. Bordered on all four sides by streets of a predominantly Irish neighborhood, the ballpark was the envy of the rest of the league when it opened in 1909. By late ’12, Mack had borrowed funds to purchase another 25% stake in the franchise, making him a 50-50 owner with Shibe, who would handle the business side, leaving Mack to handle the baseball. If Mack had a shortcoming, it was his short temper. Managing in the minors, he was known to berate his team following losses and to regret the tirades later. His solution? He would wear a business suit when he managed. That way he had no reason to repair to the clubhouse after games. By the time players had taken their showers and changed into street clothes, Mack had cooled off. Today, of course, managers must wear team uniforms during games. More important, managers cannot have any financial stake in their teams. (And owners cannot manage.) But the A’s business model was a great success. Shibe was comfortable with Mack as the front man, knowing how much proverbial skin Mack had in the game. And Mack could manage freely, without worrying about his job security. Mack was nicknamed the Tall Tactician, but he didn’t overthink strategy during games. He seldom made lineup changes, and he had little use for the sacrifice bunt. He did, however, have a distinct operating philosophy. He liked younger players whom he could shape rather than veterans and minor leaguers with more advanced but hardened skills. Mack was also a believer in clubhouse culture, putting a premium on intelligence and social graces. Most of his players were formally educated, often college graduates, and had interests outside of baseball. One example among many: Second baseman Collins, a Columbia grad who would end up in the Hall of Fame, moonlighted as a general-interest columnist for the Philadelphia Evening Bulletin. At the same time Mack had a soft spot for Rube Waddell, the team’s ace pitcher. Waddell was sensationally talented—he led the majors in strikeouts five straight years, and the modern single-season record of 349 that he set in 1904 held for six decades, until Sandy Koufax put up 382 in ’65—but he was also one of sport’s original eccentrics. Besides drinking immoderately (a “souse-paw,” The Sporting News called the lefthander), Waddell was known to leave the dugout during games to chase fire engines or to pet puppies or to join a passing parade. He allegedly was uncertain as to how many women he’d married. Mack gave Waddell chance after chance, until frustrated A’s players complained to the manager en masse. “Rube is not as black as he is painted,” Mack replied diplomatically, “although he will never be mistaken for one of Raphael’s cherubim.” When Waddell died in 1914, penniless at age 37, Mack paid for the funeral. Mack would later show similar compassion for Ty Cobb and Tris Speaker. In the late 1920s the two stars stood accused by another player, Dutch Leonard, of having fixed games. The conventional wisdom was that Mack signed both players—Cobb played his final two seasons, and Speaker his last, for Philadelphia—to give the two future Hall of Famers a chance at redemption. 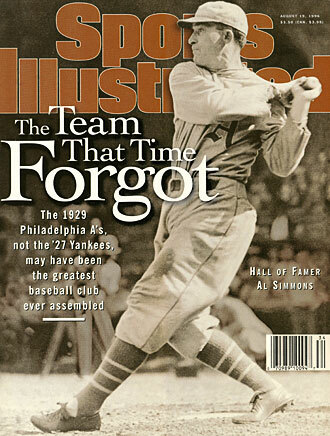 Despite the dismal 1915 season, there was guarded optimism in Philadelphia as ’16 began. The great Nap Lajoie, now in his 40s, had returned to the A’s in ’15 to finish his career. There were some intriguing prospects on the roster; maybe the A’s could pull off a few surprises. But the Fates had other plans. The team’s groundskeeper, Joe Schroeder, had died before the season. 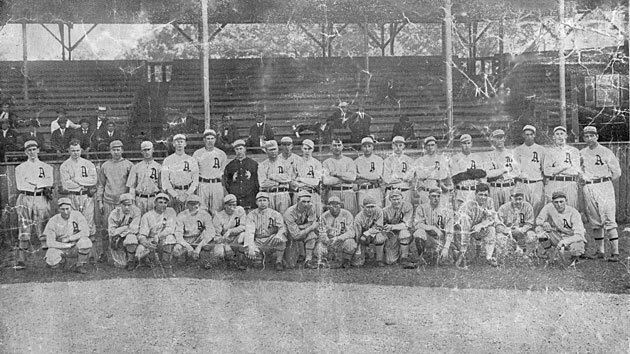 On the way to spring training the steamer carrying the A’s south encountered engine trouble and weather delays, causing the team to arrive in Jacksonville late and to play an abbreviated schedule. The customary preseason crosstown games against the Phillies were canceled due to lack of interest. After starting the season 0–6, the A’s won a pair of games at home against the Red Sox. In the latter righthander Jack Nabors was credited with the win. Little did anyone suspect that it would be his only victory of the season—of his MLB career, in fact—and he would finish 1916 with an unseemly record of 1–20. By May 1 the A’s were 4–10. Then things got ugly. There were losing streaks of 11, 12 and 20 games. In July the A’s went 2–28. Of all the team’s many deficiencies pitching was the most obvious. Veterans suddenly couldn’t find the plate. Rookies couldn’t find poise. Mack’s usually keen eye for talent had betrayed him. And when he had found promising prospects, he hadn’t always gotten them to sign. During spring training Spessard Holland, who would later become governor of Florida, declined a contract offer from the A’s, to stay in law school. Reliever and occasional starter Tom Sheehan went 1–16. Two other aces, Elmer Myers and Bullet Joe Bush, lost 23 and 24 games, respectively. Philadelphia’s pitching woes were thrown (so to speak) into relief during a four-game home stand against Detroit in early May. In the first game the A’s walked 18 batters. Over the next three days the A’s pitchers walked 11, 10 and 10 batters, respectively—all told, an astounding 49 walks over four games. Then again the catching situation didn’t make it easy for the staff to find rhythm or comfort. On July 18, Wally Schang, the Opening Day catcher, broke his jaw pursuing a popup and crashing into a concrete wall. Eight days earlier another catcher, rookie Billy Meyer, on the train to a series in St. Louis, had come down with a mean case of appendicitis. Ralph (Doc) Carroll did indeed play only 10 games for the A’s that season, the sum total of his baseball career. Carroll, a recent graduate of Tufts, informed Mack that he didn’t much like pro baseball and was heading home to Massachusetts. His career batting average was .091. Shortstop was another problematic position. One starter, Whitey Witt—a 5' 7", 150-pound teenager—had previously played for the baseball team at Goddard Seminary in Vermont. As the A’s departed for spring training, a writer covering the team noted that Witt was “green as grass,” adding that “the boat ride down the coast was as much an adventure for the kid as though he had sailed on Columbus’s Santa Maria.” Witt would play in 143 games and, by season’s end, commit 78 errors. Third base wasn’t much better. Charlie Pick, a rookie, committed 42 errors on the hot corner (and two more as an outfielder) for a fielding percentage of less than .900—a sort of Mendoza Line for fielding. A previous A’s third baseman, future Hall of Famer Frank Baker (nicknamed Home Run after his power display—two -homers!—in the 1911 World Series), had led the majors in long balls for four years. Pick, by contrast, hit zero home runs in more than 450 plate appearances in ’16. At least Pick was a regular. During the ’16 season the Athletics used a total of 50 players, an extraordinary number, especially given Mack’s reluctance to make personnel moves. For all the documents that exist from that season, there might be only one team photo, from spring training. A possible reason: There was no much roster churn, it was hard to get every one together at once. More than a half century after the A’s abominable season, Philadelphia had another historically lousy team. In 1972–73 the 76ers had a 9–73 record, the NBA’s all-time worst for an 82-game season. It wasn’t simply that these 76ers were bad; their on-court futility hexed the entire organization. Before rain-poncho giveaway night, for instance, a 76ers intern left bundles of the cheap plastic jackets inside a hot car all day, and they all melted. This same malaise afflicted the A’s in the summer of 1916. The groundskeeping was conspicuously shoddy. The Indians came to Shibe for a series in July and noticed that the grass was three-to-four inches high. By the third game of the series the grass still hadn’t been mowed, and Indians first baseman Chick Gandil went to clever lengths to make a point. As recounted in a book about Philadelphia’s ’16 season, A’s Bad as it Gets, by John G. Robertson and Andy Saunders, “During the Indians pregame warmup [Gandil] hid a ball in the long infield grass about six feet from first base. At an opportune moment in the home half of the seventh inning, Gandil asked for time, dramatically searched through the grass, retrieved the ball, and tossed it with a grin to surprised second base umpire, Billy Evans.” (Yes, the same Billy Evans who wrote season-preview columns.) The grass was cut the next day. Not surprisingly A’s attendance fell in tandem with the team’s record. Shibe Park was known for its second deck, a revolutionary bit of baseball architecture at the time. But for most of the season the extra tier was strictly decorative. By midsummer attendance was often less than 3,000 a game, a fraction of the park’s 23,000-seat capacity. 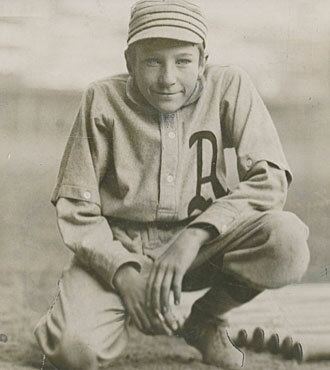 The ill-fated Van Zeist was the A's batboy. Fans weren’t alone in deciding their time was better spent away from Shibe. 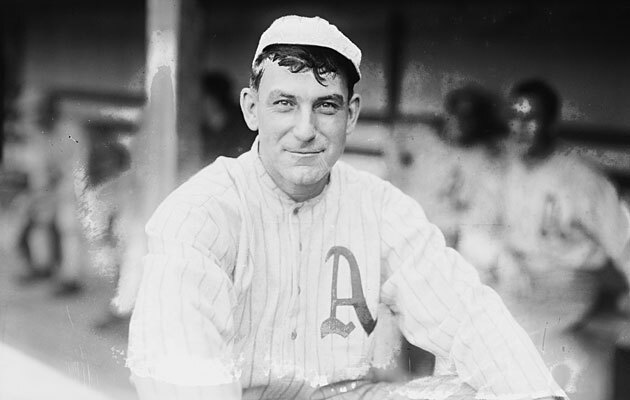 Rube Oldring had been a stalwart of the Athletics’ previous World Series teams. The outfielder was the de facto team MVP of the 1913 season and was given a Cadillac by fans after being voted the most popular baseball player in the city. Oldring, though, couldn’t abide all the losing, and after a July 1 loss, which dropped the A’s record to 17–44, he retired. He was 32 years old, and his explanation was that he wanted to settle down with his wife on their farm in Shiloh, N.J. But weeks later he was back in uniform, playing for the Yankees. That afternoon also marked the final game of Lajoie’s gilded career. In keeping with his credentials, Lajoie hit a triple. In keeping with the A’s season, he was then thrown out at home on a single to centerfield. It was in the mid-1980s that inspiration struck Macht, a baseball historian and former minor league GM. For all the books devoted to baseball players, little had been written about one of the most towering figures in the sport’s history, a manager and executive whose life paralleled the growth of the game. Armed with a contract from the University of Nebraska Press, Macht, then in his mid-50s, embarked on a biography of Connie Mack. In 1929, 13 years after their disastrous 1916 season, the A's were World Series champions again and had a case as the best team ever. The good news: Thanks to the generosity of Mack’s family and a treasure trove of printed material, Macht had little trouble banging out 1,000 manuscript pages. The bad news: He was up to only 1914. The book was published under the title Connie Mack and the Early Years of Baseball, and Macht received permission from his publisher to continue. He wrote another tome, Connie Mack: The Turbulent and Triumphant Years, 1915–1931. Last year Macht finished the third installment, The Grand Old Man of Baseball: Connie Mack in His Final Years, 1932–1956. Macht is now 86. In total he wrote 2,009 pages over 30 years, Robert Caro to Mack’s Lyndon Johnson. Then again, if any sports figure merits a multivolume biography, it’s Mack, a man whose longevity in baseball was almost comical. After the awful 1916 season, the A’s—giving new zest to the concept of rebuilding—would finish last in the standings each of the next five seasons. But Mack remained the manager. This faith was eventually rewarded. By the late 1920s the A’s were again a juggernaut. From ’26 through ’28, the Yankees put forth perhaps the most fearsome team in baseball history—the so-called Murderers’ Row—and won two of three World Series. From ’29 through ’31 the Athletics did the same, with future Hall of Famers such as Jimmie Foxx, Al Simmons, Mickey Cochrane and the great pitcher Lefty Grove. The success of these A’s, however, coincided with the Depression, and the team was in deep financial trouble. In a replay of the mid-1910s, Mack broke up the A’s. Simmons, Jimmy Dykes and Mule Haas were sold to the White Sox for $100,000. In December 1933, Mack sent Grove and two other players to the Red Sox for $125,000 and Cochrane to the Tigers for $100,000. After the ’35 season Mack sent Foxx to the Red Sox for $150,000 and two players. Though no other Philadelphia team would ever be as bad as the ’16 collective, the A’s were suddenly habitués of the cellar again, never to win another pennant, much less a World Series, in Philly. From 1935 to ’46, the A’s finished in last place nine times. Through it all Mack kept managing, and, not coincidentally, he became the A’s full owner. All told, his Philadelphia managing career would span two World Wars, six Roosevelt presidential administrations and 50—fifty!—years. It’s safe to assert that Mack’s longevity as manager will never be surpassed. His 3,731 major league wins are nearly a thousand more than those of his closest rival: ironically, McGraw, the man who once trashed the Athletics as “white elephants.” Mack’s 3,948 losses are nearly 1,600 more than those of the next finisher, Tony La Russa. Cynics will point out that Mack’s longevity was possible only because he was an owner of the team. Macht doesn’t disagree, but he adds that Mack’s uncommonly agreeable personality also extended his career. “From everyone I talked to—people who knew him, worked for him, played for him—he was universally loved and respected,” Macht says. If 1916 was the low point of Mack’s career, the end wasn’t pretty either. Deep into his 80s, he was known to fall asleep in the dugout during games, forget the names of players and become confused over signals. But he was defiant to the end. “I’m not quitting because I’m getting old,” he remarked after the ’50 season. “I’m quitting because I think people want me to.” He was 87. The year Mack died, 1956, there were 16 teams in the majors. The Dodgers and the Giants were a year away from relocating to the West Coast. Mickey Mantle won the Triple Crown. Baseball had come immeasurably far since the days of teams recruiting shortstops from seminaries and playing on unmowed infields. It laid bare this irony: Maybe more than any other figure, Mack advanced baseball’s culture and led its growth. The Tall Tactician adopted on-field innovations such as the double squeeze play, which enabled teams to score two runs on a single sacrifice bunt. His emphasis on aggressive baserunning was mimicked by other teams. He also saw the appeal of the home run, happily supporting changes that would end baseball’s Dead Ball era. But Mack’s real influence was more abstract. He showed that a manager could be authoritative without being authoritarian, giving some autonomy to his players. You could argue that he formalized the concept of rebuilding, making it acceptable for teams to sacrifice the present for the future. Above all, from his formal attire to his diction, Mack conveyed the notion that baseball was filled with virtue and dignity and was more than just a diversion. Consider that even today, one of the major youth baseball divisions is named for him. Thanks in part to Connie Mack, the game’s evolution was so great that no manager could ever have a career like his.